Prominent billionaire George Soros has launched an attack on China’s President Xi Jinping in his annual speech at the World Economic Forum in Davos, Switzerland. He warned that artificial intelligence and machine learning presented ‘unprecedented danger’ and ‘a mortal threat to open societies’ if used by authoritarian regimes. Soros has urged Washington to crack down on Chinese technology companies and said that President Xi’s Belt and Road investment plan was designed to promote only the interests of China. Soros has also warned that the US and China are locked in a cold war that could soon turn into a hot one. The billionaire said that President Trump’s decision to call China a ‘strategic’ competitor was ‘too simplistic’. He said President Trump was making concessions to China while renewing his attacks on allies, which is liable to undermine the US policy objective of curbing China’s abuses and excesses. Soros said – quote – an effective policy towards China can’t be reduced to a slogan, adding that it needs to be far more sophisticated, detailed and practical; and it must include an American economic response to the Belt and Road Initiative. Washington and Beijing have been engaged in a trade dispute over import tariffs for months. The next round of negotiations is expected to take place at the end of January when Chinese Vice Premier Liu He meets with US officials in Washington. Meanwhile, Chinese Foreign Ministry spokeswoman Hua Chunying said on Friday that Soros’ recent remark suggesting that Chinese President Xi Jinping is one of the strongest opponents of the concept of open societies does not even deserve to be refuted. 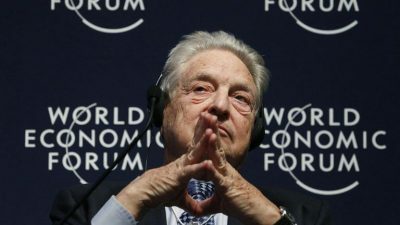 Radio Sputnik discussed the speech by George Soros at the World Economic Forum with Prof. Michel Chossudovsky, the Director of the Centre for Research on Globalization. The US and the EU have extremely fragile economies to the extent that they depend on “Made in China” commodities. This was originally published on Radio Sputnik.